The Instax Square SQ20 is Fujifilm’s latest instant camera. Making its debut at Photokina towards the end of 2018, it follows on from the previous year’s Instax SQ10 – the first “hybrid” Instax camera. Being hybrid, it uses a digital camera sensor but includes an Instax printer within it for creating a print of your shots. There have been a number of changes made to the Fujifilm Instax Square SQ20, including the introduction of several new modes, such as “motion mode” which allows the extraction of stills from short video clips. The SQ20 uses a slightly smaller sensor than its predecessor, featuring a 1/5 inch CMOS sensor (the SQ10 has a 1/4inch sensor). The lens stays the same as on the SQ10, but thanks to the smaller sensor, it equates to a slightly longer equivalent focal length (you now get 33.4mm, compared with 28.5mm from the older model). Digital zoom has been introduced to the SQ20, allowing you to get up to 4x closer to the subject. 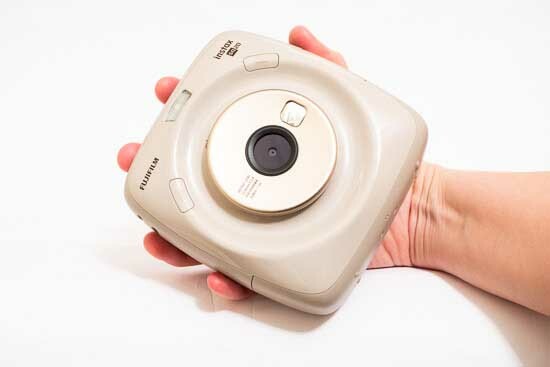 As before, the “SQ” in the name of the product denotes that the cameras use the Instax Square format, which is larger than Instax Mini and measures 86 x 72mm, with a 62 x 62mm image size. 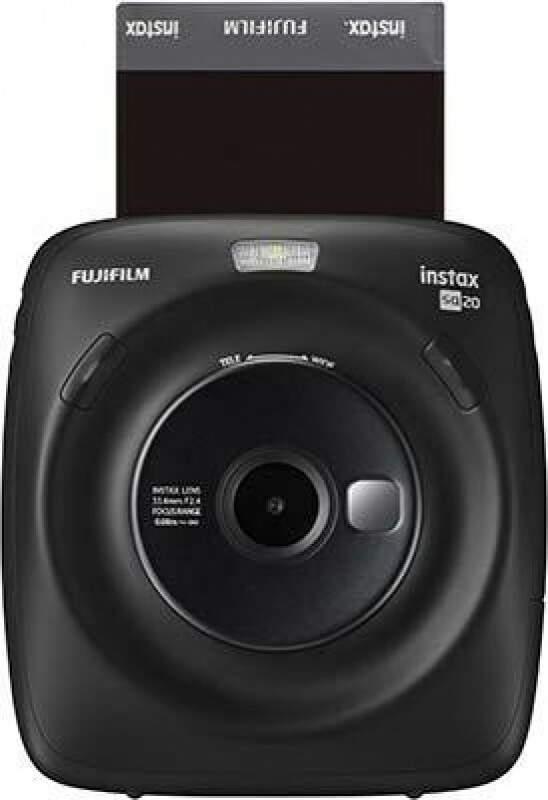 A pack of 10 shots will set you back around £9, while the Fujifilm Instax Square SQ20 camera itself costs around £170. It is available in either black or beige. The Fujifilm Instax Square SQ20 is similar, but not exactly the same as the SQ10. It still features a rounded off square design, and both are still roughly the same size and shape. It’s a slightly strange experience to use this camera when compared to other “normal” cameras and you can expect to attract attention when using it in public places as passers-by wonder what the strange device you’re using is. A difference from the previous generation of the camera is that it is now switched on via a toggle switch on the back of the camera – the SQ10 was switched on via dial around the lens on the front of the camera. On the SQ20, the lens ring instead can be used to activate the digital zoom from wide-angle to telephoto. The Fujifilm Instax Square SQ20 gives you two options for switching it on – there’s the normal picture taking mode, indicated by a blank square, and the new “motion” mode, which we’ll cover in more detail later. To take a picture, there are dual shutter release buttons on the front of the camera – which in another slightly subtle difference from the SQ10 are now rectangular, rather than round. 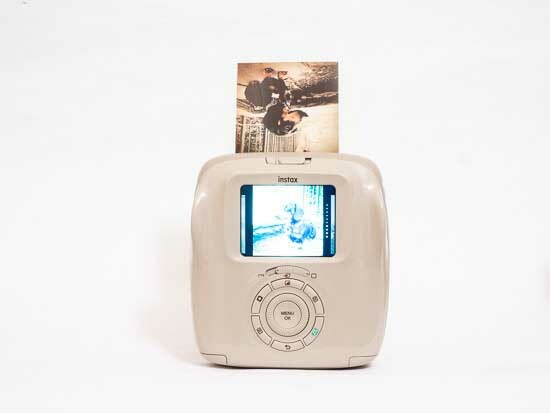 You can use the SQ20 purely as a digital camera, but if you want to take advantage of the inbuilt Instax printer, you will first need to load some film into the device. Luckily this is an extremely easy process – simply flip the film switch to unlock the camera’s back door. You should see a yellow marker on the camera which you can match to the yellow marker on the Instax film. Once you’ve popped it into place, simply shut the door and wait for the film’s protective slide to come out of the film slot. After that you’re ready to print whenever you like. The SQ10 had a switch on the side to allow you to choose between “Auto” and “Manual” printing – if the switch was set to Auto, the SQ10 would automatically print out any shot that was taken. With the SQ20, the switch is gone, but the option can still be activated from within the main menu. We’d recommend leaving this to off though, to ensure that you only print successful shots. Taking an image is a very simple process – just like the SQ10, there’s no option to change any of the settings, such as ISO, shutter speed or aperture, you simply point and shoot. There’s no viewfinder here, so you’ll be using the screen to compose your images. The screen size has been reduced both in terms of resolution and physical size when compared to the SQ20 – it’s now just 2.7-inches, with 230k-dot resolution (compared with 3-inches and 460k-dot). It’s safe to say that it’s not the best screen on the market but it does a sufficient job at helping you frame your shot. 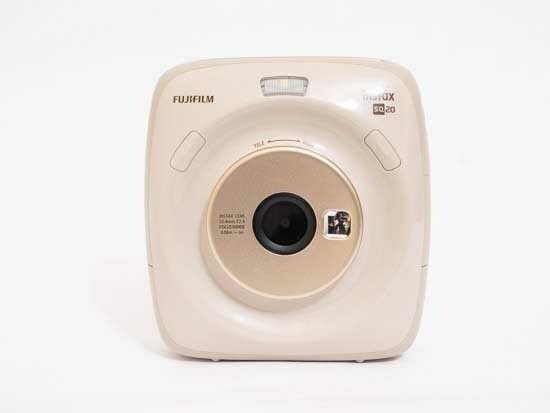 If you want to take a selfie, a small but useful addition to the Fujifilm Instax Square SQ20 is a selfie mirror which you’ll see just to the right of the lens and helps you to frame up your shot to ensure everything is where it should be. When you want to print an image you’ve taken, first press the playback button. Before you print, you can make adjustments to the shot – such as altering exposure compensation, adding a vignette or adding a filter effect. There are more filters available to add with the SQ20 when compared to the SQ10. All three of these options have their own dedicated buttons for you to access the options. Once you’re happy with the shot, you can then select print (indicated by a green icon). 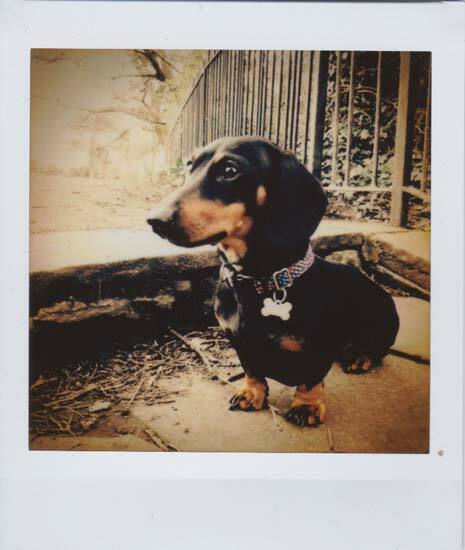 The Instax film will appear white at first – you need to allow some time for it to develop to show you the image. One of the good things about the camera being a hybrid model is that if you’re not happy with a shot, you haven’t wasted a shot – plus you can print out the same shot more than once if you feel particularly proud of it. By pressing the large Menu button in the middle of the navigational pad, you can access the different shooting modes that the Fujifilm Instax Square SQ20 has to offer. By default, you have Standard, but you can also access Bulb mode (for long exposures), Double Exposure, Split, Collage (both of which are used for placing more than one image on the same piece of film) and Timeshift Collage. The last option is a new mode for the SQ20 and allows you to shoot four images with a time difference between 0.2 seconds and 2 seconds with just one push of the shutter button. Also from the main menu, you can switch the flash on or off (or set to Auto), turn on the self-timer, adjust exposure (although there is a dedicated button for this parameter), switch on or off the AF illuminator, turn on a framing guide, adjust the Auto printing options, set the date and time (and choose to have it on your images), and a number of other functions including formatting the memory card. An interesting feature you can find in the main menu is the ability to change the function of the two front shutter buttons – you can customise one of them to do nothing at all, or to change the shooting mode. If you’re in the new “Motion” mode, the Fujifilm Instax Square SQ20 operates a little differently. With this mode, it will record up to 15 seconds of video, which you can then extract singular frames from. It’s useful for shooting moving subjects – and is very easy to execute. 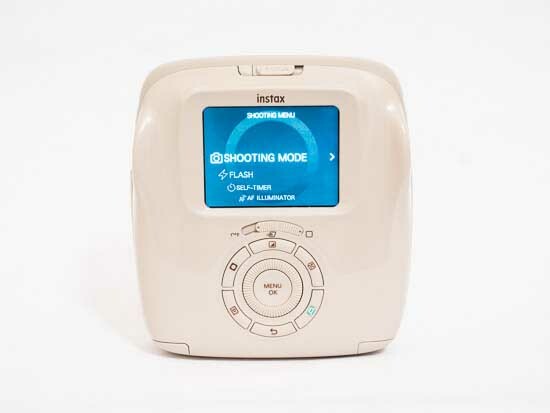 Once you’ve finished recording your video, you can use the scrolling dial on the back of the camera to move through the frames and select the one you want to keep. If you press the middle button, it’ll save it as a photo that you can print out if you wish to. Running down the side of the screen – no matter which mode you’re in – you’ll see a series of dots which indicate how many shots are left in your film pack. The battery of the Fujifilm Instax Square SQ20 is charged via USB – in fact, it can’t be removed from the camera’s body, which is another change from the SQ10. That shouldn’t be too much of an issue for most ordinary users, but it does mean that it’s not possible to carry a spare battery. The SQ20 has some inbuilt memory, but you can expand it by inserting a MicroSD card.